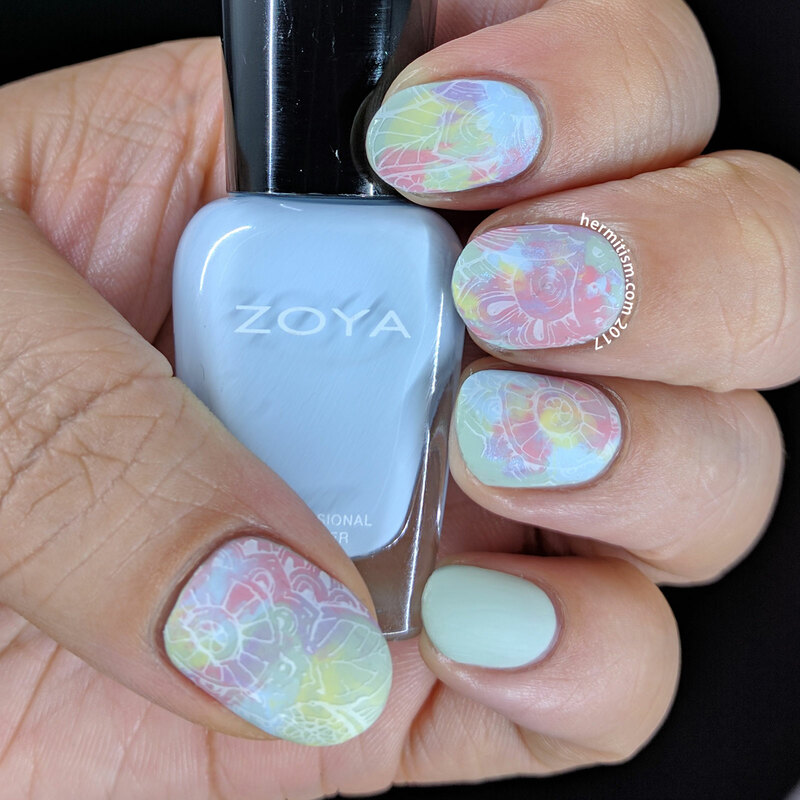 Pastel Floral is the theme for this Nail Crazies Unite challenge. I decided to try something I haven’t done before: smooshing polish on my nails with my stamper. I am not sure which person in the nail art community did this first, but I doubt it would ever have occurred to me. 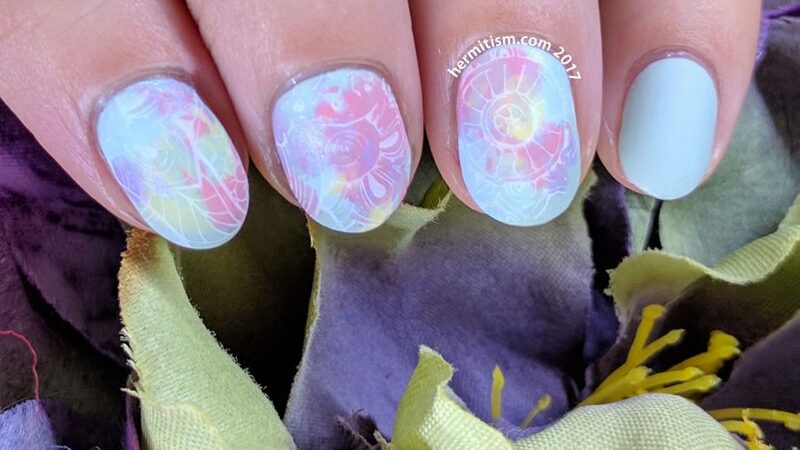 I didn’t entirely trust the technique so I started over an already solid layer of color with the drops of polish placed directly on my stamper. It was overkill. Next time I do this I will smoosh away over my base coat and just dab more on any bald spots. I think it went well for my first time and happily the delicate white lines of my stamping image helped pull it all together, especially because the stamping polish wasn’t entirely opaque so the other colors bleed through. It also dried pretty quickly. I’ll have to try again with other polishes that dry more slowly and see if it improves the dry time or if it was just the polishes I used. I topped the lot with Colores de Carol’s “Matte II Go”. Great matte topper. I need to use up my old bottle of NYC matte topper, but I’ve used this twice now and I’ll be happy to pick it up again asap. 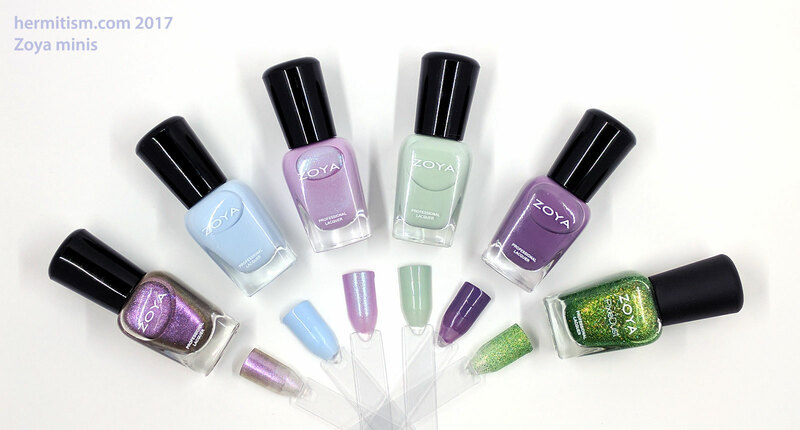 I ordered six of Zoya’s spring minis a few weeks ago and my goal is to give each of them a whirl as soon as possible. I only have two polishes left to use, although you can see that I have swatched all of them. Great formulas on all of these (I did my research first). I did find that “Blue” and “Neely” started to get difficult to work with (clumpy) after two layers, but two is all you need for opacity. I just swatch differently from everyone else I’ve seen. The swatches are in fourths so I can see how opaque the polish tends to be after each layer. “Blu” and “Neely” will be endlessly useful, but my true love is “Leslie” with its amazing blue shift. From left to right: Marion, Blu, Leslie, Neely, Violet, Cece. It was cloudy when I was taking my photos outside and as you can see it turned them rather blue. This time when I took my photos with the Shotbox I left the sideshot’s lights off. The color accuracy went way up when I took my photo from above and had my hand floating midway between my phone and the bottom of the box. 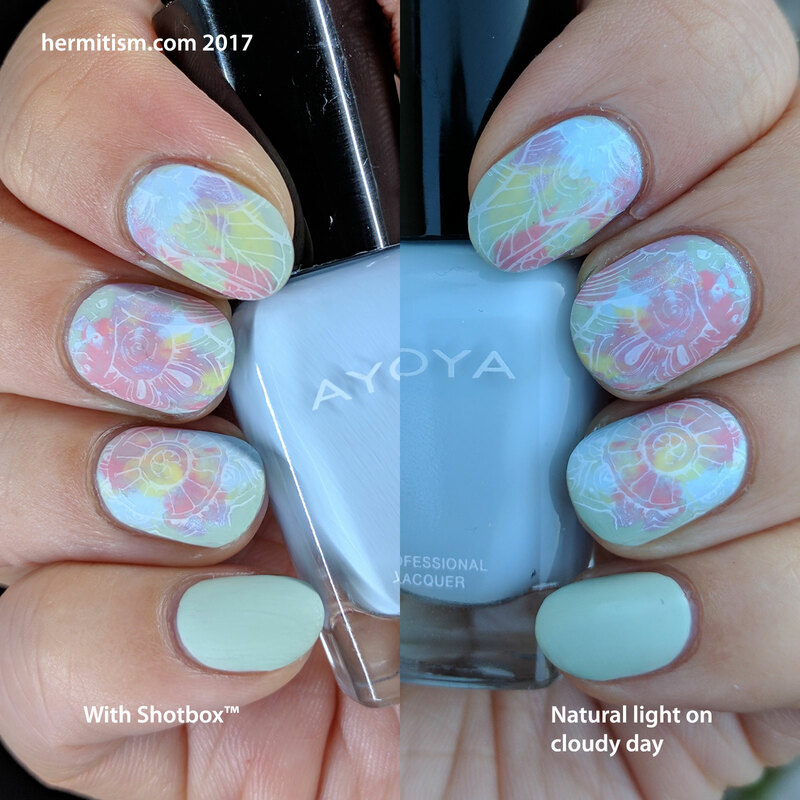 My photo of the Zoya minis had them on the very bottom and I did have to correct the light levels, but it was an extremely easy fix. I did not need to edit the photo after that.